Sinking into an outdoor spa when the temperature is in single digits and snow is falling can be one of life’s most soothing and relaxing experiences. It warms your body and your soul and makes the frosty weather almost seem romantic. But there is more to making sure you’re getting the most out of your hot tub than keeping the power running and the cover on. 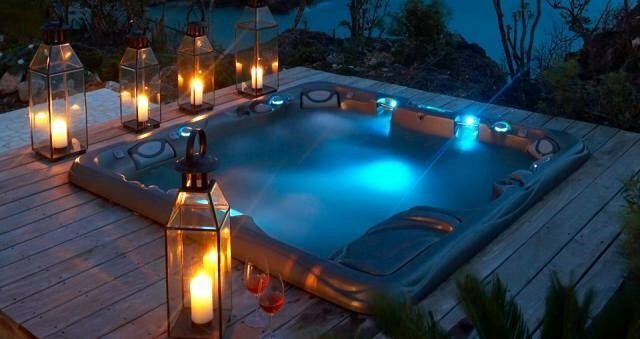 Here are some tips for keeping your hot tub in top form all winter. First, drain the water and clean the plumbing of any built-up oily residue, grime or heater scale deposits before refilling it. This will help maintain water chemistry. Next, check your cover for wear and tear, such as faded or cracked vinyl, heavy or bowed foam cores, torn seams and handles and broken buckles. For the best winter spa experience, you need to keep the heat in, so a quality cover is essential. It also reduces utility bills. You might also consider investing in a floating thermal blanket that sits on top of the water. This will also go a long way toward reducing your energy bill. Do not fluctuate the water temperature. Lowering the temperature and then raising it before using the hot tub consumes more energy and puts a strain on the spa’s pumps. Maintaining a higher temperature also provides a safe guard against freezing in the event of a power outage. Also, remember after each use to close the air induction control knobs. Air induction lines increase jet pressure, which lowers water temperature by forcing cold outside air through the jets. If your spa has an auto heat or freeze protect system, make sure that it is activated whenever the temperature drops at night. If it has a thermostat control, set it past freeze and into the heat or high portion of the dial. If you have a timer, it is a good idea to set it to come on for 15 minutes every hour. This will ensure good hot water circulation through the pipes as well as keep the water hot. If your spa lacks all of those features, you must keep it running on low speed heat mode 24 hours per day until there is no danger of freezing temperatures. A better option is to install a timer onto the electric line that feeds the spa, which will save money. Don’t forget to regularly monitor the water level. Leaks can lower the water level, which could stop spa circulation and heating and result in the water freezing. Water also evaporates more rapidly off the hot tub surface in colder temperatures. Finally, make certain all your tub supplies are handy. It’s important to keep the water chemistry in balance and the sanitizer levels where they should be.